In this article we are going to introduce joomla! to the beginners and try to highlight some core features, goodies & detail overview about Joomla! Joomla! is an award-winning content management system (CMS), which helps to build Web sites, powerful online applications & contents of the website without having much programming or technical knowledge. Joomla is built on top of the free and open source scripting language PHP. It is the 2nd most popular web site development software after WordPress. You can create and extend to any kind of website you want to built on top of Joomla. It is an open source solution that is freely available to everyone. A content management system is a software or set of software that keeps track of every piece of content on your Web site, Contents can be simple text, photos, music, video, documents, or just about anything you can think of. A major advantage of using a CMS is that it requires almost no technical skill or knowledge to manage a website. Since the CMS manages all your content of website it makes your life easy to manage your website and contents. Joomla was the result of a fork of Mambo on August 17, 2005. Joomla developers created a website called OpenSourceMatters.org (OSM) to distribute information to users, developers, web designers and the community in general. Project leader Andrew Eddie wrote a letter that appeared on the announcements section of the public forum at mamboserver.com. A little more than one thousand people had joined OpenSourceMatters.org within a day, most posting words of encouragement and support. On August 18, Andrew Eddie called for a community association from Clark Simson Miller. The core team eventually chose a name that was not on the list of suggested names provided by the community. On September 22, the new name, “Joomla!,” was announced. It is the anglicised spelling of the Swahili word jumla meaning “all together” or “as a whole ” which also has a similar meaning in at least Arabic and Urdu. Joomla 1.5 was 1st LTS version. Then 1.6, 1.7 & 2.5 LTS was released. From version 3.0 joomla is following new release cycle with 3 short term releases with 6 month support and then the final LTS version. From version 3.x joomla is following 3.0, 3.1, 3.2 and the LTS 3.5 type release cycle so that the extension developers get more time to test, adopt and upgrade to latest version & site builders get longer supports and time to upgrade. 1st of all download and install xampp/wamp/uwamp in any drive of your PC. Now extract the zip folder, Copy The unzipped folder and paste it inside the htdocs directory of xampp or www directory of wamp/uwamp and rename it as joomla/joom or anything you want. Now start xampp/wamp/uwamp and start apache and mysql. The 2nd step is all about Database configuration. Here you have to choose “mysqli” for Database Type, “root” as Username and “localhost” as the Host name. You can keep the default table prefix or create your own but keep in mind you have to give “_” [UnderScore] sign after the table prefix. In the Database name section you have to give the name of database you have created for the installation. For this you will have to create the database 1st. Now we have to create a database for our installation. To do so hit http://localhost/phpmyadmin/ from your browser. 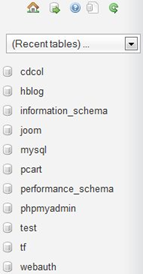 Here the page PHPMyAdmin will be found and we will create a database named “joom” like below. After clicking the create button you will see the new DB named joom in the sidebar on the left. Now fill the DB name and click next. You will get greetings massage about joomla installation. Now before proceed you must have to click to REMOVE INSTALLATION FOLDER. 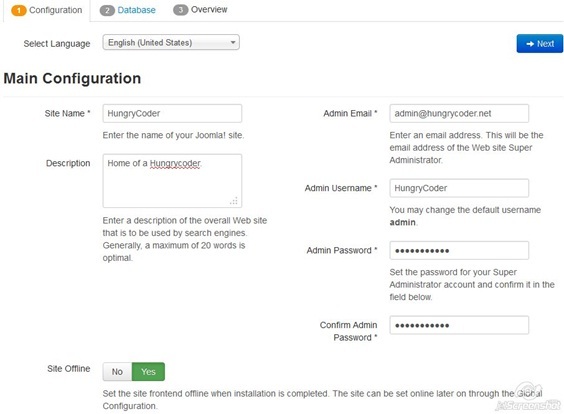 Now click on SITE button to view the front-end of your installation and administrator to access the joomla site backend. This is all done for now. Browse the front end and backend to explore more about joomla! Hope you have enjoyed the article. In the upcoming articles about joomla I will try to highlight about joomla backend and templete development. Thanks , This was a very helpfull article.Does Joomla work without OOP?